Are you responsible for managing your WordPress site? Are you new to WordPress and need to get up to speed quickly? Then WP101 is perfect for you. You can always find free, homemade videos on YouTube, but they lack the quality and often, are outdated. Not this 21-part video training course. Each video is professionally scripted, meticulously produced, closed-captioned, and always up-to-date. Sample a FREE, 3-minute video to get a feel for the quality. It provides a quick introduction to WordPress and shows why it has become the most popular web publishing platform today. 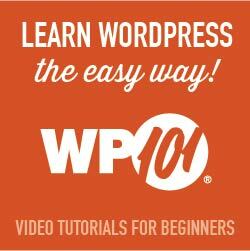 Each video is just 5 minutes or less and provides a complete overview of WordPress in a little over an hour. By the end of the basic course, you’ll have a solid grasp of all the WordPress fundamentals. Ready for more advanced training? Continue learning with additional courses on specific topics related to WordPress or return anytime for a quick refresher. Your All-Access Pass includes the 20-part WordPress 101 course, plus unlimited access to 180+ tutorial videos across 10 courses. You’ll also get every new course created while your subscription is active! Try WP101 for up to 30 days. If you don’t like it, cancel and they’ll refund your money, no questions asked.